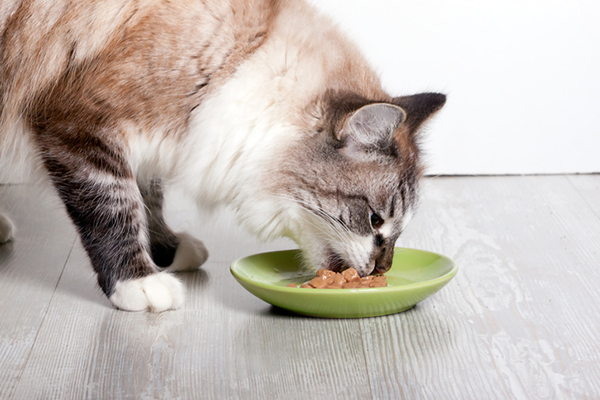 What should you do if your cat won’t eat wet food anymore? You will find some information about the benefit of dry food and wet food. Besides, you also know why your cat won’t eat wet food anymore as well as some solutions to encourage them to eat again. Cats often act according to their habitual behaviors. Any significant changes in their activities need to be carefully considered. In that case, changing its diet will require more attention because potential health problems can occur if you apply them abruptly or improperly. If one day, your cat won’t eat wet food anymore although this food is one of his favorites, don’t worry. We will show you some methods to encourage your pet to keep on eating. But before that, we will talk a little about dry food and wet food as someone may think about trying another food kind instead of the wet one. Do you choose dry food or wet food? There are two aspects that pet owners consider between wet and dry food. Some people believe that wet food is suitable for cats, others think dry food is best. However, both of these foods are beneficial, and if used together, you will form a complete and comprehensive diet for your cat. The first benefit of a dry diet is the convenience. You can easily measure the ration for cats without fear of excess or lack of food in the menu. Besides, the product is easy to maintain; long shelf life is also a positive point. If you choose dry food, your cat will actively chew, remove the plaque on the teeth. Feeding dry foods will make the cat drink plenty of water. Also, the cat will divide the food and eat several times instead of eating for a while. However, in some stages of the cat's life, soft foods should be eaten, such as older cats or kittens and cats during weaning. There are some types of dry products that can soften if soaked in water, you can also consider using. Cats are quite picky about eating, and some love to eat wet foods. The visible benefits of wet food, when used for cats, are a convenience in the eating process. They will eat only once and not have to drink too much water during the meal. The amount of water in the food is so much higher than cats do not feel thirsty. Wet foods are good for cats that are prone to constipation, kidney stones or urinary tract diseases, kidney disease because the amount of water present in cat food is sufficiently provided. Pay attention to preserving wet food. Allow the food to cool after it has been removed from the refrigerator before feeding the cat or you can maintain the product in a dry location but ensure a stable temperature. In particular, do not place food over hot places. According to some surveys, cats like to eat a mix of both wet and dry foods. Wet foods help to diversify the cat diet because it has a variety of texture. On the other hand, dry foods meet the cat's natural dietary needs (broken down menus). As a result, some pet owners have adopted dry and wet mixtures. There are no rules for compulsory use of two types of food at the same time or separate use. The use of the product is due to the preference of the owners. However, if you choose to use a mixture of two products, pay attention to the appropriate dose, avoid feeding too much leading to the loss of weight control. Your cat eats wet food, but it stops now? A cat that doesn't want to eat might have a sickness. Or you can check the food ingredients in case some of them may make your cat feel uncomfortable. And if this situation continues happening, you should bring your pet to the vet. If you see your cat not eating for several meals and this problem keeps on like that then, you can think about change the food brand you are using. But, in case you want to stay with a specific food brand, you can use the other flavors to attract your cat. Your cay may be fed up with one kind of food for a long time. Therefore, after changing, it is more likely to eat again. The wet food often makes the bowl dirty because it has water. In case you don't have enough time to change or clean the bowl regularly, it can release some uncomfortable smell. That may be one of the reasons why your cat won't eat wet food anymore. Remember, they are "picky eaters". In addition, wet food can create a moisture environment for germs to start growing in leftover food, which can bring illness to your cat. As their instinct, cats avoid consuming the putrid-smelling meat. If you are using plastic bowls, let's consider changing into ceramic or metal one as it is easier to keep them clean. In case your cat wants to stops eating wet food, you can try the mixed food for a short run. Previously, semi-moist food for cats is prevalent because it is in a convenient bag for use and storage. This food is like grains but contains more water. Of course, your cat will love this food more than nuts or canned foods, and will usually eat all the food that is given. Unfortunately, the cat food sold by a well-known brand has been banned because of preservatives that harm cat's health such as anemia. While these semi-moist foods are banned from production, pet owners still expect food that can replace them. Therefore, you should try to mix the wet food with dry food for your cat to use. Among the findings of pet nutritionists, it has been found that, given a choice between dry food and canned food, the cat instinctively chooses the right amount of food and the balance of nutrients to meet their dietary needs. Cats will love the diet that is frequently changing between dry and wet foods. Before preparing a ration in large quantity for cats to eat gradually by themselves, you should talk to your veterinarian about the cat's diet and make sure you also care about it other special needs. Hope that you can apply some methods successfully above to make sure the situation “your cat won’t eat wet food anymore” happens.